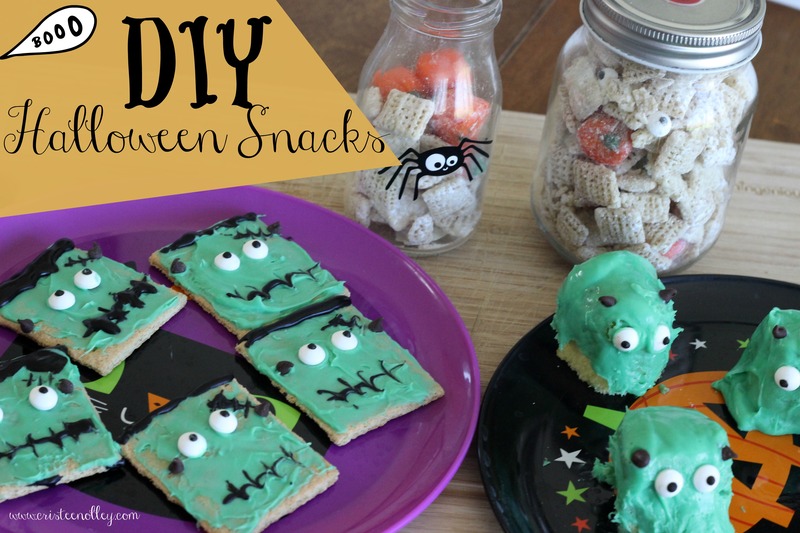 DIY HALLOWEEN SNACKS FOR KIDS! BOO-YAH! I have a treat for you..and your kids! I don’t know about you but we are filled with Halloween events to attend this year..like A LOT!! So I have a lot on my To-Do list with so little time. (from left to right: Symphony, Abram, Nia, and Juliet) Beautiful fam right?! My four year old had so much fun making these. You don’t need much to make them either. Graham crackers, green frosting, edible eyeballs, and mini semi- sweet chocolate chips. This is a very easy halloween treat to make for a party or just at home with the little ones. Now onto the second easy peasy snack! I love muddy buddies but most of them have peanut butter and Jax is allergic to peanut butter so this mama had to search for different options and found one! add the marshmallows. I did 1/2 cup but you can add more if you like. add candies. Or in mine I used the edible eyeballs, and those pumpkin candies you can find pretty much everywhere. These little monsters turned out way differently than I had imagined to be completely honest with you. I think they turned out looking like those little monsters or whatever they are from pac man…but because of how good they tasted I had to share with you all! Then I got some of these limited edition PUMPKIN SPICE TWINKIES!! Yes you read that correctly! I then placed them in the freezer for 30 minutes and once I put them on a plate we added the eyeballs and mini chocolate chips for the horns. They look so silly but OH SO DELISH! Then you just place them on a popsicle stick and Ta-Da! Thanks for reading and don’t forget to check out Nia’s post. (click the image of her below) You won’t want to miss that!